The example of an early methodist who discovered how to draw on heaven's resources for his family's daily provisions. Early Methodists were encouraged in their faith by seeing Heaven answer prayers of others. 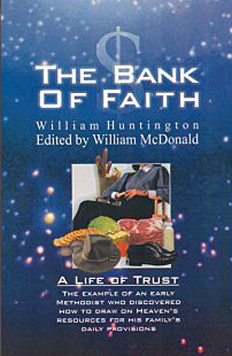 Huntington asked God to become his banker and provider for everything from shoes to milk to rent money. The miraculous provision of daily needs in the days of George Whitefield and John Wesley is still appropriate for Christians in the 21st century. Edited by William McDonald, second president of the National Holiness Association. New! Lower retail price! Was $7.99.